Magikarp compared to yelloweye rockfish - nope, sorry buddy. The triumphant reemergence of Pokémon in 2016 hardly went unnoticed, especially by anyone living near cellular towers. The second coming of the worldwide sensation, catalyzed by the gaming app Pokémon Go, led to manifestations on countless electronic resources and media, including but not limited to exquisite fan art, in-depth gaming guides, clever memes, and viral videos displaying mass mobs of humanoids roaming the streets in search of rare Pokémon. Among that digital onslaught were videos claiming to identify the “real life animals” that were the basis for certain Pokémon. Sadly, many of these videos seemed more targeted toward obtaining viewership than actually producing researched, well thought-out material. When I saw a Magikarp, a fish-type Pokémon, being compared to a yelloweye rockfish, I was inclined to offer a more proper comparison, utilizing my background in evolutionary biology and ichthyology. To begin this hypothetical analysis, a simple examination of the Pokémon-name Magikarp reveals the apparent root, -karp, or carp; a yelloweye rockfish is most assuredly not a type of carp; in fact, those fishes are in separate orders. The Japanese name for Magikarp is コイキング, or Koikingu, and koi are simply domesticated carp that have been bred generation after generation via artificial selection to produce an ornamental subspecies, affectionately known as living jewels and swimming flowers. 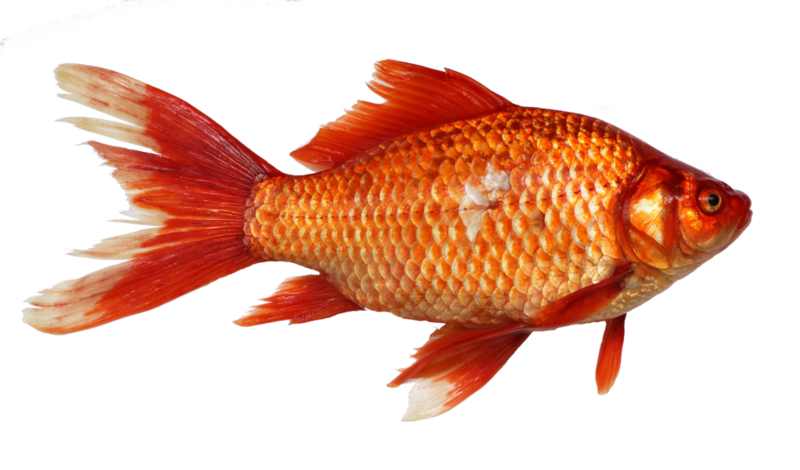 Guessing that a goldfish is the inspiration for Magikarp is not too far off, as modern goldfish were bred from Prussian carp, Carassius gibelio, and Magikarp’s orangey coloration and rounded, stubbier body resembles a common goldfish. 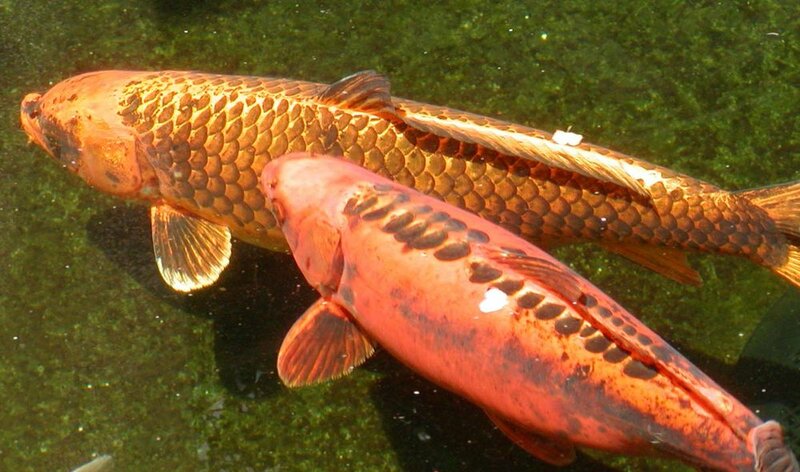 However, there is one distinct feature that distinguishes koi from goldfish: Barbels, or whisker-like sensory organs fixated on the lips of koi, not a part of a goldfish’s morphology. The presence of barbels on Magikarp excludes goldfish as a possible template species. When I was a young lad, enjoying the characteristic colored cartridges that locked deftly into my Gameboy, Magikarp was a staple figure, a pixelated ambassador that connected Japanese culture to the rest of the world. Thanks to Magikarp, I learned about the existence of koi, or nishikigoi (literally “brocaded carp”), and how engrained those decorative fish (among other fishes) were in Asiatic societies. For centuries within Eastern Asian cultures, carp have been emblematic of auspicious traits: strength, health, luck, wealth, tenacity, and destiny. Often when we imagine a Japanese pond, our thoughts synthesize into soothing glimpses of the aesthetically pleasing fish, painted in intricate patterns of red, orange, black, yellow, white, and cream, gracefully swimming beneath an oriental garden tucked aside an ancient temple. No matter if your Pokémon experience is limited, you probably know that Magikarp, this rather weak and ubiquitous Pokémon, is not that popular. This is understandably so, seeing that its splash ability is a sad excuse for an attack. For the average player, it’s inevitable to encounter one, or two, or fifty Magikarp while perusing the virtual realm for more desirable Pokémon. Often the little fellow is described as the “world’s weakest Pokémon” and the “worst Pokémon ever”. Nevertheless, the docile, fictional Magikarp does have roots in reality and, believe you me, the real world fish has a deep, rich history and deserves our respect. Carp, or cyprinids, make up the largest family among all fishes and even the largest out of all vertebrates with over 3,000 extant species. Many carp are hardy freshwater fishes, capable of adapting to withstand brackish and saline water, low oxygen environments, and travelling vast distances in baskets with wet moss. These are reasons why carp were among the first species to have been domesticated by humans as a food source. The fictional Magikarp is also quite hardy, capable of living in extremely polluted ponds and waters both marine and fresh. 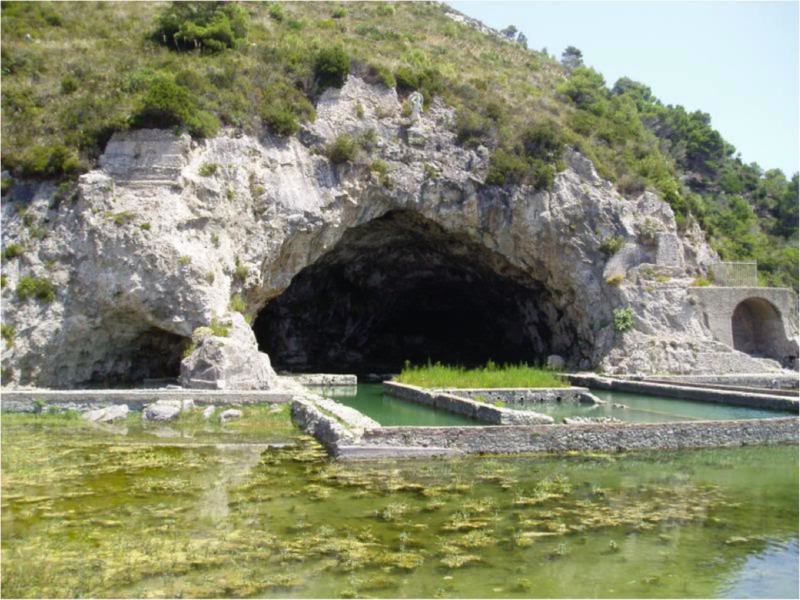 The Romans, over 2,000 years ago, cultivated carp from the Danube River by way of piscinae (expensive stone built ponds) and in China, aquaculture of carp was present at least in the year 475 BCE. From ancient times, fast forward almost two millennia to the early 1800’s where in the Niigata Prefecture of Japan, in a mountainous local between the cities of Nagaoka and Ojiya. There the isolated inhabitants, who were resourceful, artistic, and competitive, began breeding their magoi (food carp) to create new varieties, just the same way humans have selectively created a multitude of dog breeds. Winters in this mountain village could have 6 meters (20 feet) of snow accumulation, at times getting so cold that the farmers/breeders would bring colored carps into their homes, placing them into special-built indoor ponds. In a handful of decades, the popularity of keeping and breeding koi spread across Japan, producing more varieties of distinct patterns and colorations. Not only was there monetary value in raising nishikigoi, but there was also the aforementioned auspicious and superstitious qualities that carp provide as well as the invaluable companionship a pet can provide, which is nothing new, as even in millennia past certain Romans of the higher classes adorned their beloved pet carp in expensive jewelry. After the turn of the century, around 1904, domesticated mirror carp were imported from Germany, creating even more variety. But it was only after WWII that intensive breeding and dissemination of colored carps truly began. The pursuit expanded as the standard of living increased and aquaculture methods improved. In Japan, with land being so limited and valuable, in tandem with the precepts of Buddhism, quaint garden ponds stocked with koi became a rational product of the culture. Nowadays there are over a hundred named varieties of koi, recognized by an eccentric and dedicated subculture of breeders and competitors seeking to produce grand champions, a subculture with a similar enthusiasm and incentive embodied by Pokémon fanatics. Prized specimens of koi can be sold at auction for around $15,000-$30,000 and in some cases, over $1,000,000. So is there a specific species of fish that can be attributed to the infamous Magikarp? Yes and no. Although the common carp, Cyprinus carpio, has long been presumed to be the species once bred in Japan into the now domesticated varieties of koi that we see today, new molecular evidence suggests that a separate species, a type of East Asian carp, likely Cyprinus rubrofuscus, which has been inaccurately deemed a subspecies of the common carp under the synonym Cyprinus carpio haematopterus, is the true parent species of the domesticated subspecies within Japan. Still more research is needed to confirm and trace the lineages and produce proper systematics of koi in Japan (and across the globe). 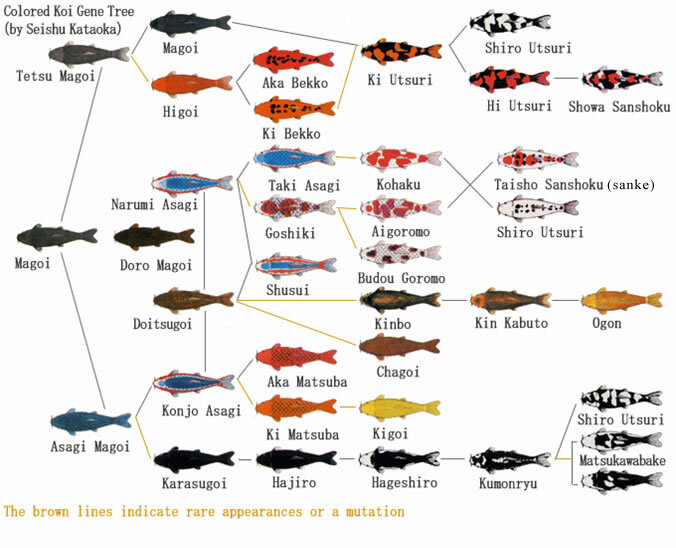 Unsurprisingly, due to the introduction of mirror carp and other species from Western cultures over the centuries, classifying the multigenerational hybridizations of today’s introgressed koi is rather complicated; Japan truly has a spectacularly diverse and colorful melting pot of domesticated fishes. Lastly, to further my argument that Magikarp is a parallel of Japanese nishikigoi, I offer the evidence of Gyarados, the impressive dragon-like Pokémon resulting from Magikarp’s evolution—an evolution that perfectly mirrors an ancient Chinese myth, pulsing through time from the late Han Dynasty. The myth describes a carp attempting to ascend the treacherous rapids of the Yellow River and should the fish succeed in its aquatic trek by implementing innate qualities of strength and perseverance, the tiny creature morphs into a fabulous dragon. Centuries past, that same myth crossed the Sea of Japan, saturating Japanese culture, as evidenced by the Japanese saying “koi no taki-nobori”, which translates as “koi climbing the rapids”. From a scientific viewpoint, it is known that individuals cannot evolve—only populations evolve—and in the real world, such exotic instances of metamorphosis do not exist. 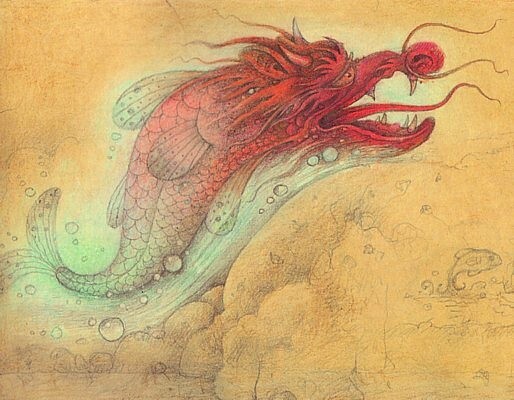 But from a fantastical viewpoint, it is intriguing to ponder upon a determined fish magically morphing into a powerful dragon, be it within a virtual realm or a mythological one. The inherent dichotomy between transformations in reality versus transformations in fiction is intriguing, but what is even more provocative is our dependence on myth and fiction, on our generational stories, no matter if they are told around a campfire, a dinner table, or from a handheld gaming console. Are koi and Magikarp heroic symbols in disguise? Indeed carp and nishikigoi are inspirational figures, yearning for something greater, offering glimmers of multicolored hope. Even if Magikarp is despised for being pathetically weak, that little Pokémon reminds us in our deepest of thoughts that it takes only a bit of willpower, time, and perseverance to transform an individual into something marvelous.